Mondo | Me or not? 31 Luglio 2009 MondoBarack Obama, internet, politica, twitter, USA, web 2.0Lore! E dall’amministrazione Obama, un’altra svolta 2.0 per quello che riguarda la politica. Non più lettere per contattare i senatori, ma tweet che vengono poi raccolti nella piattaforma. 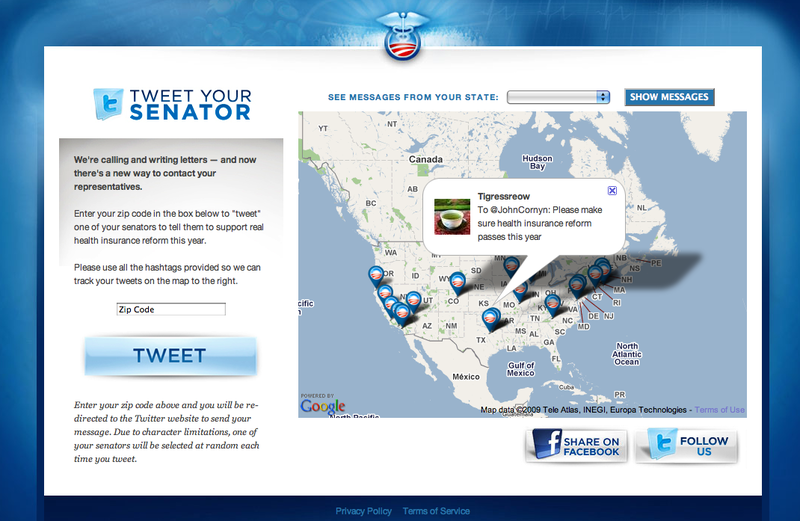 Dal sito di Obama è infatti ora possibile ad accedere a Tweet your senator: inserendo il proprio cap si viene reindirizzati alla home page di Twitter con già impostato il campo @reply ad uno dei propri senatori per far sapere quello che si pensa sulla riforma dell’assistenza sanitaria ed invitarlo a votare. La pagina mostra poi una cartina aggiornata in tempo reale con i tweet geolocalizzati ed è anche possibile selezionare un singolo stato e seguirne solo i tweet relativi. È un’idea interessante, che avvicina ancora di più i cittadini al governo e tutto il sistema politico all’interazione bidirezionale con il web e soprattutto con Twitter che sta diventando sempre di più centrale nelle discussioni politiche (a partire dalle primarie americane alla rivolta in Iran). 21 Giugno 2009 Mondoconcerto, musica, ufficio, web radioLore! Meno male che c’è la web radio con la diretta sul sito ufficiale. 5 Giugno 2009 MondoBarack Obama, citazioni, politica, USALore! Ecco il discorso integrale che Obama ha tenuto ieri mattina a Il Cairo. Da leggere tutto. Ed essere orgogliosi e fieri che almeno da qualche parte del mondo esiste un Presidente così. “We meet at a time of tension between the United States and Muslims around the world – tension rooted in historical forces that go beyond any current policy debate. The relationship between Islam and the West includes centuries of co-existence and cooperation, but also conflict and religious wars. More recently, tension has been fed by colonialism that denied rights and opportunities to many Muslims, and a Cold War in which Muslim-majority countries were too often treated as proxies without regard to their own aspirations. Moreover, the sweeping change brought by modernity and globalization led many Muslims to view the West as hostile to the traditions of Islam. Violent extremists have exploited these tensions in a small but potent minority of Muslims. The attacks of September 11th, 2001 and the continued efforts of these extremists to engage in violence against civilians has led some in my country to view Islam as inevitably hostile not only to America and Western countries, but also to human rights. This has bred more fear and mistrust. So long as our relationship is defined by our differences, we will empower those who sow hatred rather than peace, and who promote conflict rather than the cooperation that can help all of our people achieve justice and prosperity. This cycle of suspicion and discord must end. I have come here to seek a new beginning between the United States and Muslims around the world; one based upon mutual interest and mutual respect; and one based upon the truth that America and Islam are not exclusive, and need not be in competition. Instead, they overlap, and share common principles – principles of justice and progress; tolerance and the dignity of all human beings. I do so recognizing that change cannot happen overnight. No single speech can eradicate years of mistrust, nor can I answer in the time that I have all the complex questions that brought us to this point. But I am convinced that in order to move forward, we must say openly the things we hold in our hearts, and that too often are said only behind closed doors. There must be a sustained effort to listen to each other; to learn from each other; to respect one another; and to seek common ground. As the Holy Koran tells us, “Be conscious of God and speak always the truth.” That is what I will try to do – to speak the truth as best I can, humbled by the task before us, and firm in my belief that the interests we share as human beings are far more powerful than the forces that drive us apart. Part of this conviction is rooted in my own experience. I am a Christian, but my father came from a Kenyan family that includes generations of Muslims. As a boy, I spent several years in Indonesia and heard the call of the azaan at the break of dawn and the fall of dusk. As a young man, I worked in Chicago communities where many found dignity and peace in their Muslim faith. As a student of history, I also know civilization’s debt to Islam. It was Islam – at places like Al-Azhar University – that carried the light of learning through so many centuries, paving the way for Europe’s Renaissance and Enlightenment. It was innovation in Muslim communities that developed the order of algebra; our magnetic compass and tools of navigation; our mastery of pens and printing; our understanding of how disease spreads and how it can be healed. Islamic culture has given us majestic arches and soaring spires; timeless poetry and cherished music; elegant calligraphy and places of peaceful contemplation. And throughout history, Islam has demonstrated through words and deeds the possibilities of religious tolerance and racial equality. Much has been made of the fact that an African-American with the name Barack Hussein Obama could be elected President. But my personal story is not so unique. The dream of opportunity for all people has not come true for everyone in America, but its promise exists for all who come to our shores – that includes nearly seven million American Muslims in our country today who enjoy incomes and education that are higher than average. Moreover, freedom in America is indivisible from the freedom to practice one’s religion. That is why there is a mosque in every state of our union, and over 1,200 mosques within our borders. That is why the U.S. government has gone to court to protect the right of women and girls to wear the hijab, and to punish those who would deny it. Islam is a part of America. And I believe that America holds within her the truth that regardless of race, religion or station in life, all of us share common aspirations – to live in peace and security; to get an education and to work with dignity; to love our families, our communities, and our God. These things we share. This is the hope of all humanity. Of course, recognizing our common humanity is only the beginning of our task. Words alone cannot meet the needs of our people. These needs will be met only if we act boldly in the years ahead; and if we understand that the challenges we face are shared, and our failure to meet them will hurt us all. For we have learned from recent experience that when a financial system weakens in one country, prosperity is hurt everywhere. When a new flu infects one human being, all are at risk. When one nation pursues a nuclear weapon, the risk of nuclear attack rises for all nations. When violent extremists operate in one stretch of mountains, people are endangered across an ocean. And when innocents in Bosnia and Darfur are slaughtered, that is a stain on our collective conscience. That is what it means to share this world in the 21st century. That is the responsibility we have to one another as human beings. This is a difficult responsibility to embrace. For human history has often been a record of nations and tribes subjugating one another to serve their own interests. Yet in this new age, such attitudes are self-defeating. Given our interdependence, any world order that elevates one nation or group of people over another will inevitably fail. So whatever we think of the past, we must not be prisoners of it. Our problems must be dealt with through partnership; progress must be shared. That does not mean we should ignore sources of tension. Indeed, it suggests the opposite: we must face these tensions squarely. And so in that spirit, let me speak as clearly and plainly as I can about some specific issues that I believe we must finally confront together. The first issue that we have to confront is violent extremism in all of its forms. In Ankara, I made clear that America is not – and never will be – at war with Islam. We will, however, relentlessly confront violent extremists who pose a grave threat to our security. Because we reject the same thing that people of all faiths reject: the killing of innocent men, women, and children. And it is my first duty as President to protect the American people. The situation in Afghanistan demonstrates America’s goals, and our need to work together. Over seven years ago, the United States pursued al Qaeda and the Taliban with broad international support. We did not go by choice, we went because of necessity. I am aware that some question or justify the events of 9/11. But let us be clear: al Qaeda killed nearly 3,000 people on that day. The victims were innocent men, women and children from America and many other nations who had done nothing to harm anybody. And yet Al Qaeda chose to ruthlessly murder these people, claimed credit for the attack, and even now states their determination to kill on a massive scale. They have affiliates in many countries and are trying to expand their reach. These are not opinions to be debated; these are facts to be dealt with. Make no mistake: we do not want to keep our troops in Afghanistan. We seek no military bases there. It is agonizing for America to lose our young men and women. It is costly and politically difficult to continue this conflict. We would gladly bring every single one of our troops home if we could be confident that there were not violent extremists in Afghanistan and Pakistan determined to kill as many Americans as they possibly can. But that is not yet the case. That’s why we’re partnering with a coalition of forty-six countries. And despite the costs involved, America’s commitment will not weaken. Indeed, none of us should tolerate these extremists. They have killed in many countries. They have killed people of different faiths – more than any other, they have killed Muslims. Their actions are irreconcilable with the rights of human beings, the progress of nations, and with Islam. The Holy Koran teaches that whoever kills an innocent, it is as if he has killed all mankind; and whoever saves a person, it is as if he has saved all mankind. The enduring faith of over a billion people is so much bigger than the narrow hatred of a few. Islam is not part of the problem in combating violent extremism – it is an important part of promoting peace. We also know that military power alone is not going to solve the problems in Afghanistan and Pakistan. That is why we plan to invest ê1.5 billion each year over the next five years to partner with Pakistanis to build schools and hospitals, roads and businesses, and hundreds of millions to help those who have been displaced. And that is why we are providing more than ê2.8 billion to help Afghans develop their economy and deliver services that people depend upon. Let me also address the issue of Iraq. Unlike Afghanistan, Iraq was a war of choice that provoked strong differences in my country and around the world. Although I believe that the Iraqi people are ultimately better off without the tyranny of Saddam Hussein, I also believe that events in Iraq have reminded America of the need to use diplomacy and build international consensus to resolve our problems whenever possible. Indeed, we can recall the words of Thomas Jefferson, who said: “I hope that our wisdom will grow with our power, and teach us that the less we use our power the greater it will be.” Today, America has a dual responsibility: to help Iraq forge a better future – and to leave Iraq to Iraqis. I have made it clear to the Iraqi people that we pursue no bases, and no claim on their territory or resources. Iraq’s sovereignty is its own. That is why I ordered the removal of our combat brigades by next August. That is why we will honor our agreement with Iraq’s democratically-elected government to remove combat troops from Iraqi cities by July, and to remove all our troops from Iraq by 2012. We will help Iraq train its Security Forces and develop its economy. But we will support a secure and united Iraq as a partner, and never as a patron. And finally, just as America can never tolerate violence by extremists, we must never alter our principles. 9/11 was an enormous trauma to our country. The fear and anger that it provoked was understandable, but in some cases, it led us to act contrary to our ideals. We are taking concrete actions to change course. I have unequivocally prohibited the use of torture by the United States, and I have ordered the prison at Guantanamo Bay closed by early next year. So America will defend itself respectful of the sovereignty of nations and the rule of law. And we will do so in partnership with Muslim communities which are also threatened. The sooner the extremists are isolated and unwelcome in Muslim communities, the sooner we will all be safer. The second major source of tension that we need to discuss is the situation between Israelis, Palestinians and the Arab world. America’s strong bonds with Israel are well known. This bond is unbreakable. It is based upon cultural and historical ties, and the recognition that the aspiration for a Jewish homeland is rooted in a tragic history that cannot be denied. Around the world the Jewish people were persecuted for centuries, and anti-semitism in Europe culminated in unprecedented holocaust. Tomorrow I will visit Buchenwald, which was part of a network of camps where Jews were enslaved, tortured, shot and gassed to death by the Third Reich. Six million Jews were killed – more than the entire Jewish population of Israel today. Denying that fact is baseless, ignorant, and hateful. Threatening Israel with destruction – or repeating vile stereotypes about Jews – is deeply wrong, and only serves to evoke in the minds of Israelis this most painful of memories while preventing the peace that the people of this region deserve. On the other hand, it is also undeniable that the Palestinian people – Muslims and Christians – have suffered in pursuit of a homeland. For more than sixty years they have endured the pain of dislocation. Many wait in refugee camps in the West Bank, Gaza, and neighboring lands for a life of peace and security that they have never been able to lead. They endure the daily humiliations – large and small – that come with occupation. So let there be no doubt: the situation for the Palestinian people is intolerable. America will not turn our backs on the legitimate Palestinian aspiration for dignity, opportunity, and a state of their own. For decades, there has been a stalemate: two peoples with legitimate aspirations, each with a painful history that makes compromise elusive. It is easy to point fingers – for Palestinians to point to the displacement brought by Israel’s founding, and for Israelis to point to the constant hostility and attacks throughout its history from within its borders as well as beyond. But if we see this conflict only from one side or the other, then we will be blind to the truth: the only resolution is for the aspirations of both sides to be met through two states, where Israelis and Palestinians each live in peace and security. That is in Israel’s interest, Palestine’s interest, America’s interest, and the world’s interest. That is why I intend to personally pursue this outcome with all the patience that the task requires. The obligations that the parties have agreed to under the Road Map are clear. For peace to come, it is time for them – and all of us – to live up to our responsibilities. Palestinians must abandon violence. Resistance through violence and killing is wrong and does not succeed. For centuries, black people in America suffered the lash of the whip as slaves and the humiliation of segregation. But it was not violence that won full and equal rights. It was a peaceful and determined insistence upon the ideals at the center of America’s founding. This same story can be told by people from South Africa to South Asia; from Eastern Europe to Indonesia. It’s a story with a simple truth: that violence is a dead end. It is a sign of neither courage nor power to shoot rockets at sleeping children, or to blow up old women on a bus. That is not how moral authority is claimed; that is how it is surrendered. Now is the time for Palestinians to focus on what they can build. The Palestinian Authority must develop its capacity to govern, with institutions that serve the needs of its people. Hamas does have support among some Palestinians, but they also have responsibilities. To play a role in fulfilling Palestinian aspirations, and to unify the Palestinian people, Hamas must put an end to violence, recognize past agreements, and recognize Israel’s right to exist. At the same time, Israelis must acknowledge that just as Israel’s right to exist cannot be denied, neither can Palestine’s. The United States does not accept the legitimacy of continued Israeli settlements. This construction violates previous agreements and undermines efforts to achieve peace. It is time for these settlements to stop. Israel must also live up to its obligations to ensure that Palestinians can live, and work, and develop their society. And just as it devastates Palestinian families, the continuing humanitarian crisis in Gaza does not serve Israel’s security; neither does the continuing lack of opportunity in the West Bank. Progress in the daily lives of the Palestinian people must be part of a road to peace, and Israel must take concrete steps to enable such progress. Finally, the Arab States must recognize that the Arab Peace Initiative was an important beginning, but not the end of their responsibilities. The Arab-Israeli conflict should no longer be used to distract the people of Arab nations from other problems. Instead, it must be a cause for action to help the Palestinian people develop the institutions that will sustain their state; to recognize Israel’s legitimacy; and to choose progress over a self-defeating focus on the past. America will align our policies with those who pursue peace, and say in public what we say in private to Israelis and Palestinians and Arabs. We cannot impose peace. But privately, many Muslims recognize that Israel will not go away. Likewise, many Israelis recognize the need for a Palestinian state. It is time for us to act on what everyone knows to be true. Too many tears have flowed. Too much blood has been shed. All of us have a responsibility to work for the day when the mothers of Israelis and Palestinians can see their children grow up without fear; when the Holy Land of three great faiths is the place of peace that God intended it to be; when Jerusalem is a secure and lasting home for Jews and Christians and Muslims, and a place for all of the children of Abraham to mingle peacefully together as in the story of Isra, when Moses, Jesus, and Mohammed (peace be upon them) joined in prayer. The third source of tension is our shared interest in the rights and responsibilities of nations on nuclear weapons. This issue has been a source of tension between the United States and the Islamic Republic of Iran. For many years, Iran has defined itself in part by its opposition to my country, and there is indeed a tumultuous history between us. In the middle of the Cold War, the United States played a role in the overthrow of a democratically-elected Iranian government. Since the Islamic Revolution, Iran has played a role in acts of hostage-taking and violence against U.S. troops and civilians. This history is well known. Rather than remain trapped in the past, I have made it clear to Iran’s leaders and people that my country is prepared to move forward. The question, now, is not what Iran is against, but rather what future it wants to build. It will be hard to overcome decades of mistrust, but we will proceed with courage, rectitude and resolve. There will be many issues to discuss between our two countries, and we are willing to move forward without preconditions on the basis of mutual respect. But it is clear to all concerned that when it comes to nuclear weapons, we have reached a decisive point. This is not simply about America’s interests. It is about preventing a nuclear arms race in the Middle East that could lead this region and the world down a hugely dangerous path. I understand those who protest that some countries have weapons that others do not. No single nation should pick and choose which nations hold nuclear weapons. That is why I strongly reaffirmed America’s commitment to seek a world in which no nations hold nuclear weapons. And any nation – including Iran – should have the right to access peaceful nuclear power if it complies with its responsibilities under the nuclear Non-Proliferation Treaty. That commitment is at the core of the Treaty, and it must be kept for all who fully abide by it. And I am hopeful that all countries in the region can share in this goal. The fourth issue that I will address is democracy. I know there has been controversy about the promotion of democracy in recent years and much of this controversy is connected to the war in Iraq. So let me be clear: no system of government can or should be imposed upon one nation by any other. That does not lessen my commitment, however, to governments that reflect the will of the people. Each nation gives life to this principle in its own way, grounded in the traditions of its own people. America does not presume to know what is best for everyone, just as we would not presume to pick the outcome of a peaceful election. But I do have an unyielding belief that all people yearn for certain things: the ability to speak your mind and have a say in how you are governed; confidence in the rule of law and the equal administration of justice; government that is transparent and doesn’t steal from the people; the freedom to live as you choose. Those are not just American ideas, they are human rights, and that is why we will support them everywhere. There is no straight line to realize this promise. But this much is clear: governments that protect these rights are ultimately more stable, successful and secure. Suppressing ideas never succeeds in making them go away. America respects the right of all peaceful and law-abiding voices to be heard around the world, even if we disagree with them. And we will welcome all elected, peaceful governments – provided they govern with respect for all their people. This last point is important because there are some who advocate for democracy only when they are out of power; once in power, they are ruthless in suppressing the rights of others. No matter where it takes hold, government of the people and by the people sets a single standard for all who hold power: you must maintain your power through consent, not coercion; you must respect the rights of minorities, and participate with a spirit of tolerance and compromise; you must place the interests of your people and the legitimate workings of the political process above your party. Without these ingredients, elections alone do not make true democracy. The fifth issue that we must address together is religious freedom. Islam has a proud tradition of tolerance. We see it in the history of Andalusia and Cordoba during the Inquisition. I saw it firsthand as a child in Indonesia, where devout Christians worshiped freely in an overwhelmingly Muslim country. That is the spirit we need today. People in every country should be free to choose and live their faith based upon the persuasion of the mind, heart, and soul. This tolerance is essential for religion to thrive, but it is being challenged in many different ways. Among some Muslims, there is a disturbing tendency to measure one’s own faith by the rejection of another’s. The richness of religious diversity must be upheld – whether it is for Maronites in Lebanon or the Copts in Egypt. And fault lines must be closed among Muslims as well, as the divisions between Sunni and Shia have led to tragic violence, particularly in Iraq. Freedom of religion is central to the ability of peoples to live together. We must always examine the ways in which we protect it. For instance, in the United States, rules on charitable giving have made it harder for Muslims to fulfill their religious obligation. That is why I am committed to working with American Muslims to ensure that they can fulfill zakat. Likewise, it is important for Western countries to avoid impeding Muslim citizens from practicing religion as they see fit – for instance, by dictating what clothes a Muslim woman should wear. We cannot disguise hostility towards any religion behind the pretence of liberalism. Indeed, faith should bring us together. That is why we are forging service projects in America that bring together Christians, Muslims, and Jews. That is why we welcome efforts like Saudi Arabian King Abdullah’s Interfaith dialogue and Turkey’s leadership in the Alliance of Civilizations. Around the world, we can turn dialogue into Interfaith service, so bridges between peoples lead to action – whether it is combating malaria in Africa, or providing relief after a natural disaster. The sixth issue that I want to address is women’s rights. I know there is debate about this issue. I reject the view of some in the West that a woman who chooses to cover her hair is somehow less equal, but I do believe that a woman who is denied an education is denied equality. And it is no coincidence that countries where women are well-educated are far more likely to be prosperous. Now let me be clear: issues of women’s equality are by no means simply an issue for Islam. In Turkey, Pakistan, Bangladesh and Indonesia, we have seen Muslim-majority countries elect a woman to lead. Meanwhile, the struggle for women’s equality continues in many aspects of American life, and in countries around the world. Our daughters can contribute just as much to society as our sons, and our common prosperity will be advanced by allowing all humanity – men and women – to reach their full potential. I do not believe that women must make the same choices as men in order to be equal, and I respect those women who choose to live their lives in traditional roles. But it should be their choice. That is why the United States will partner with any Muslim-majority country to support expanded literacy for girls, and to help young women pursue employment through micro-financing that helps people live their dreams. Finally, I want to discuss economic development and opportunity. I know that for many, the face of globalization is contradictory. The Internet and television can bring knowledge and information, but also offensive sexuality and mindless violence. Trade can bring new wealth and opportunities, but also huge disruptions and changing communities. In all nations – including my own – this change can bring fear. Fear that because of modernity we will lose of control over our economic choices, our politics, and most importantly our identities – those things we most cherish about our communities, our families, our traditions, and our faith. But I also know that human progress cannot be denied. There need not becontradiction between development and tradition. Countries like Japan and South Korea grew their economies while maintaining distinct cultures. The same is true for the astonishing progress within Muslim-majority countries from Kuala Lumpur to Dubai. In ancient times and in our times, Muslim communities have been at the forefront of innovation and education. This is important because no development strategy can be based only upon what comes out of the ground, nor can it be sustained while young people are out of work. Many Gulf States have enjoyed great wealth as a consequence of oil, and some are beginning to focus it on broader development. But all of us must recognize that education and innovation will be the currency of the 21st century, and in too many Muslim communities there remains underinvestment in these areas. I am emphasizing such investments within my country. And while America in the past has focused on oil and gas in this part of the world, we now seek a broader engagement. On education, we will expand exchange programs, and increase scholarships, like the one that brought my father to America, while encouraging more Americans to study in Muslim communities. And we will match promising Muslim students with internships in America; invest in on-line learning for teachers and children around the world; and create a new online network, so a teenager in Kansas can communicate instantly with a teenager in Cairo. On economic development, we will create a new corps of business volunteers to partner with counterparts in Muslim-majority countries. And I will host a Summit on Entrepreneurship this year to identify how we can deepen ties between business leaders, foundations and social entrepreneurs in the United States and Muslim communities around the world. On science and technology, we will launch a new fund to support technological development in Muslim-majority countries, and to help transfer ideas to the marketplace so they can create jobs. We will open centers of scientific excellence in Africa, the Middle East and Southeast Asia, and appoint new Science Envoys to collaborate on programs that develop new sources of energy, create green jobs, digitize records, clean water, and grow new crops. And today I am announcing a new global effort with the Organization of the Islamic Conference to eradicate polio. And we will also expand partnerships with Muslim communities to promote child and maternal health. All these things must be done in partnership. Americans are ready to join with citizens and governments; community organizations, religious leaders, and businesses in Muslim communities around the world to help our people pursue a better life. The issues that I have described will not be easy to address. But we have a responsibility to join together on behalf of the world we seek – a world where extremists no longer threaten our people, and American troops have come home; a world where Israelis and Palestinians are each secure in a state of their own, and nuclear energy is used for peaceful purposes; a world where governments serve their citizens, and the rights of all God’s children are respected. Those are mutual interests. That is the world we seek. But we can only achieve it together. I know there are many – Muslim and non-Muslim – who question whether we can forge this new beginning. Some are eager to stoke the flames of division, and to stand in the way of progress. Some suggest that it isn’t worth the effort – that we are fated to disagree, and civilizations are doomed to clash. Many more are simply skeptical that real change can occur. There is so much fear, so much mistrust. But if we choose to be bound by the past, we will never move forward. And I want to particularly say this to young people of every faith, in every country – you, more than anyone, have the ability to remake this world. All of us share this world for but a brief moment in time. The question is whether we spend that time focused on what pushes us apart, or whether we commit ourselves to an effort – a sustained effort – to find common ground, to focus on the future we seek for our children, and to respect the dignity of all human beings. It is easier to start wars than to end them. It is easier to blame others than to look inward; to see what is different about someone than to find the things we share. But we should choose the right path, not just the easy path. There is also one rule that lies at the heart of every religion – that we do unto others as we would have them do unto us. This truth transcends nations and peoples – a belief that isn’t new; that isn’t black or white or brown; that isn’t Christian, or Muslim or Jew. It’s a belief that pulsed in the cradle of civilization, and that still beats in the heart of billions. It’s a faith in other people, and it’s what brought me here today. We have the power to make the world we seek, but only if we have the courage to make a new beginning, keeping in mind what has been written. The Holy Koran tells us, “O mankind! We have created you male and a female; and we have made you into nations and tribes so that you may know one another.” The Talmud tells us: “The whole of the Torah is for the purpose of promoting peace.” The Holy Bible tells us, “Blessed are the peacemakers, for they shall be called sons of God.” The people of the world can live together in peace. We know that is God’s vision. Now, that must be our work here on Earth. Thank you. And may God’s peace be upon you. 2 Giugno 2009 MondoBarack Obama, citazioni, rainbow, USALore! Sono un breve estratto dal comunicato stampa diffuso ieri dalla Casa Bianca. 27 Maggio 2009 Mondonotizie, rainbow, USALore! Con una decisione contraddittoria, la Corte Suprema della California ha dichiarato valida sia il referendum sulla Proposition 8 che i matrimoni celebrati prima della stessa. Così ecco il video della campagna NOH8. Nulla da dire sul video, semplice, efficace, che ricorda ancora una volta sempre i soliti concetti base: siamo i tuoi amici, siamo i tuoi colleghi, siamo la tua famiglia o i tuoi amici, siamo tutti uguali. Ma non siamo trattati equally. Interesante poi il gioco di parole. No eight (inteso come no alla proposition 8) ha la stessa pronuncia di no hate (non odiare). La campagna (silenziosa) è stata realizzata da Adam Bouska e ha già raggiunto 400 sostenitori, tra cui personaggi famosi come Tila Tequila e Perez (Hilton). 17 Maggio 2009 MondoMondo, notizie, Olanda, rainbowLore! … ma in una scuola cristiana. Un insegnate omosessuale è stato sospeso dopo aver fatto “outing”. È accaduto ad Emst, località dell’Olanda, alla “Scuola con la Bibbia”, che fa parte di una rete di scuole religiose di ispirazione cristiano-protestante che conta più di 80 istituti in tutto il Paese. “L’orientamento sessuale dell’insegnante va contro le basi e gli obiettivi della scuola”, ha detto la direzione. 22 Aprile 2009 MondoBarack Obama, facebook, politicaLore! Altra scoperta interessante grazie a Facebook. Per l’Heart Day 2009 lo staff di Obama ha organizzato una sessione di chat con Majora Carter (classe 1966), un avvocato esperto in giustizia ambientale (in italiano sappiamo talmente tanto cos’è che non c’è nemmeno la voce su Wikipedia) e un consulente economica. Ha origini africano-americane e, prima di entrare nel settore privato, ha fondato la Sustainable South Bronx, una organizzazione no profit impegnata nel proprio nel campo dell’environmental justice. 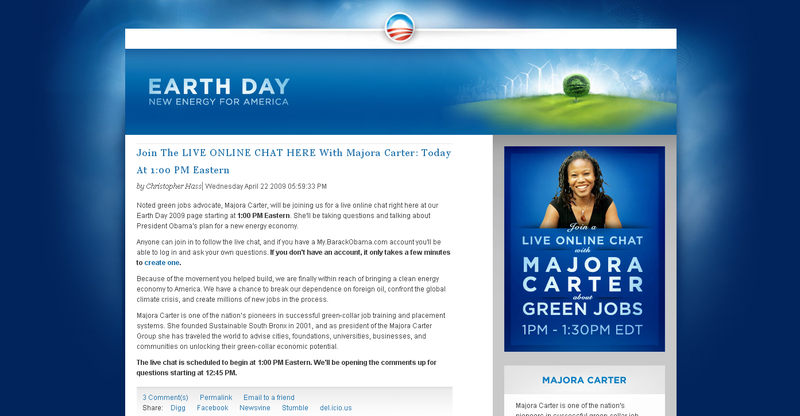 Ora è la presidente del Majora Carter Group, che si occupa di informare le aziende e le comunità in tutto il mondo su come sbloccare il loro green-collar economic potential. Nella live chat Majora risponderà alle domande e illustrerà i piani del Presidente per una nuova economia dell’energia. Direi che questa è politica web 2.0. Oltre che comunicazione e dialogo con i cittadini. 25 Febbraio 2009 Mondocitazioni, giornalismoLore! In Sri Lanka c’è un mestiere, oltre a quello del soldato, che richiede il sacrificio della vita. È il lavoro del giornalista. Negli ultimi anni i mezzi d’informazione indipendenti hanno subìto un numero crescente di attacchi. Le loro sedi sono state bruciate, bombardate o chiuse. Molti giornalisti sono stati intimiditi, minacciati e uccisi. Per me è stato un onore appartenere a tutte queste categorie, in particolare, negli ultimi tempi, all’ultima. Lavoro nel giornalismo da tanto tempo. Nel 2009 il Sunday Leader compie quindici anni. In questo periodo sono cambiate molte cose nello Sri Lanka, soprattutto in peggio. Siamo nel pieno di una guerra civile combattuta da individui assetati di sangue. Il terrore, che venga dei terroristi o dallo stato è all’ordine del giorno. L’omicidio è il principale strumento con cui lo stato tenta di controllare chi difende le libertà civili. Oggi sono i giornalisti, domani saranno i giudici. Il Sunday Leader è un giornale controverso perché noi chiamiamo le cose con il loro nome. Non usiamo eufemismi. I nostri articoli d’inchiesta si basano su prove documentate ottenute grazie al senso civico dei cittadini, che ci fanno arrivare il materiale correndo dei grossi rischi. Ogni giornale ha il taglio, e noi non nascondiamo il nostro. Ci impegniamo perché lo Sri Lanka diventi una democrazia trasparente, laica e libera. Trasparente perché il governo deve rispondere al popolo e non abusare della sua fiducia. Laica perché, in una società multietnica e multiculturale come la nostra, il laicismo è l’unico terreno comune. Liberale perché tutti gli esseri umani sono diversi e vanno accettati per quello che sono. E democratico: se c’è bisogno che vi spieghi perché, è meglio che smettiate di comprare questo giornale. Il Sunday Leader non si è mai nascosto dietro alle opinioni della maggioranza. Abbiamo sostenuto che il terrorismo separatista va debellato ma che è più importante analizzarne le cause. Ci siamo anche battuti contro il terrorismo di stato nella cosiddetta guerra al terrore e non abbiamo taciuto il nostro orrore per il fatto che lo Sri Lanka è l’unico paese al mondo che bombarda regolarmente i suoi cittadini. Per questo siamo stati definiti traditori. Ma se questo è tradimento, allora ne siamo orgogliosi. La nostra ostilità per la guerra non deve essere confusa con il sostegno delle Tigri. Le Tigri per la liberazione della patria Tamil (Ltte) sono una delle organizzazioni più spietate e sanguinarie del mondo e vanno eliminate. Tuttavia, combatterle violando i diritti dei cittadini tamil, bombardandoli e uccidendoli senza pietà, non solo è sbagliato ma disonora i singalesi. L’occupazione militare del nord e dell’est del paese costringeranno i tamil di quelle zone a vivere per sempre come cittadini di serie B. Non pensate di poterli placare ricoprendoli di “sviluppo” e ricostruzione” dopo la guerra. Le ferite si segneranno per sempre. Si sa che sono stato brutalmente aggredito in due occasioni e che, in una terza, hanno sparato raffiche di mitragliatrice contro casa mia. Malgrado le ipocrite dichiarazioni del governo, la polizia non ha mai aperto un’indagine seria per scoprire chi fossero gli autori delle aggressioni, ancora a piede libero. Ho motivo di credere che tutti e tre gli episodi siano stati ispirati dal governo. Quando sarò ucciso, il responsabile sarà il governo. Ricordatevi questo: il Sunday leader esiste per voi, che siate singalesi, tamil, musulmani, di casta bassa, omosessuali, dissidenti o invalidi. Il suo staff continuerà a lottare, indomito e senza paura, con il coraggio a cui siete abituati. Non date per scontato questo impegno. Sia ben chiaro che qualunque sacrificio facciamo noi giornalisti, non è per la gloria o per l’arricchimento personale: è per voi. Che lo meritiate o meno è un’altra questione. Quanto a me, Dio solo sa se ci ho provato. Lasantha Wickramatunga, chief editor del Sunday Leader, è stato ucciso l’8 gennaio 2009, mentre si stava recando in ufficio. Quello riportato sopra è il suo editoriale postumo. Update: Qui sotto, la versione integrale in inglese. Perché non l’ho trovata prima!? Many people suspect that The Sunday Leader has a political agenda: it does not. If we appear more critical of the government than of the opposition it is only because we believe that – pray excuse cricketing argot – there is no point in bowling to the fielding side. Remember that for the few years of our existence in which the UNP was in office, we proved to be the biggest thorn in its flesh, exposing excess and corruption wherever it occurred. Indeed, the steady stream of embarrassing expos‚s we published may well have served to precipitate the downfall of that government. What is more, a military occupation of the country’s north and east will require the Tamil people of those regions to live eternally as second-class citizens, deprived of all self respect. Do not imagine that you can placate them by showering “development” and “reconstruction” on them in the post-war era. The wounds of war will scar them forever, and you will also have an even more bitter and hateful Diaspora to contend with. A problem amenable to a political solution will thus become a festering wound that will yield strife for all eternity. If I seem angry and frustrated, it is only because most of my countrymen – and all of the government – cannot see this writing so plainly on the wall. As for the readers of The Sunday Leader, what can I say but Thank You for supporting our mission. We have espoused unpopular causes, stood up for those too feeble to stand up for themselves, locked horns with the high and mighty so swollen with power that they have forgotten their roots, exposed corruption and the waste of your hard-earned tax rupees, and made sure that whatever the propaganda of the day, you were allowed to hear a contrary view. For this I – and my family – have now paid the price that I have long known I will one day have to pay. I am – and have always been – ready for that. I have done nothing to prevent this outcome: no security, no precautions. I want my murderer to know that I am not a coward like he is, hiding behind human shields while condemning thousands of innocents to death. What am I among so many? It has long been written that my life would be taken, and by whom. All that remains to be written is when. That The Sunday Leader will continue fighting the good fight, too, is written. For I did not fight this fight alone. Many more of us have to be – and will be – killed before The Leader is laid to rest. I hope my assassination will be seen not as a defeat of freedom but an inspiration for those who survive to step up their efforts. Indeed, I hope that it will help galvanise forces that will usher in a new era of human liberty in our beloved motherland. I also hope it will open the eyes of your President to the fact that however many are slaughtered in the name of patriotism, the human spirit will endure and flourish. Not all the Rajapakses combined can kill that. 23 Febbraio 2009 Mondodiritti, Gran Bretagna, libertàLore! Il governo britannico ha spiegato che continuerà a impedire l’ingresso “a coloro che vogliono diffondere estremismo, odio e messaggi violenti”. Gli inglesi, da sempre paladini della libertà di espressione, ci spiegano così una volta di più dov’è il limite a questa libertà: nel rispetto della dignità della persona.